high technology and the know-how of our skin experts. 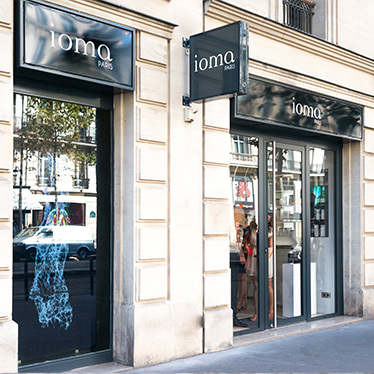 Welcome to the first Boutique IOMA in Paris ! In the middle, a texture bar in the shape of a cruise liner, painted in white gloss and hand-built, where you can discover and assess IOMA’s cult skincare and new products. At the sides, two IOMA Sphère 2 devices where you can have a beauty check-up in less than 20 minutes: your skin is scanned, using micro and macro measurements to read your skin deep down to a level invisible to the naked eye and generate skincare recommendations that best protect skin and delay the effects of time. A unique and bespoke response for each skin that takes account of its past and what it has experienced. Opposite, is the majestic IOMA Factory, a highly sophisticated miniature formulation factory that, in less than 5 minutes, designs MA CRÈME, Day or Night version, a bespoke skincare chosen from among 171 million possible formulas. An ultra-modern camera process allows you to watch this bespoke skincare being made before your very eyes. Within the ambiance of Boutique IOMA Paris, our skin experts offer you skincare or body treatments tailored to your needs. It is a chance to test the savoir-faire and special touch of IOMA – high-tech beauty solutions complemented with the manual expertise of our aestheticians. Because your skin is unique, your ideal treatment will be recommended based on your diagnosis. Some of these treatments are also available in Beauty Success and Marionnaud partner institutes. 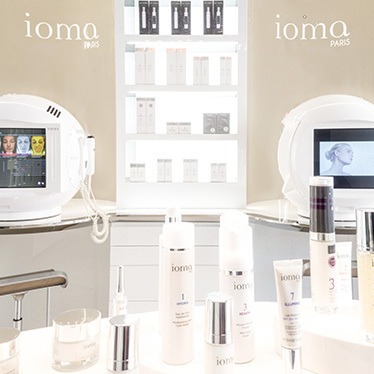 An introductory treatment to get you acquainted with the world of IOMA Paris and rediscover a radiant skin! You’ll emerge from this short beauty treatment with your skin perfectly cleansed, supple and radiant: and all in record time! A customised treatment to meet your needs. The IOMA Paris 3-phase cleansing treatment offers an immediate “beautiful skin” effect. Discover the art of touch, the IOMA Paris way. An ultra-targeted care, unique thanks to its double modelling, conditioning and relaxing. 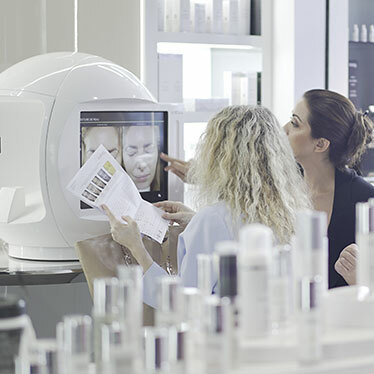 The customised high-technology diagnosis that allows our skin experts to adapt to your specific needs. Sculpting that combines relaxing movements with targeted finger pressure to offer an incredible regenerating effect and a soothing feeling of relaxation. At the end of the treatment, your skin is relaxed, smoother and radiant! A high-tech care with immediately proven results. This treatment allies the IOMA Paris high-technology to its unique skin expertise. Your skin is revitalised and your mind is relaxed. Based on a finger pressure technique, this treatment includes 3-phase cleansing, the application of two face masks and an alternating combination of relaxing and invigorating sculpting according to the needs of your skin. A high-technology treatment with immediately proven results. A signature personal care offering completely holistic care. This treatment is totally adapted to your underlying needs and is a real introduction to the world of IOMA. With its high-tech diagnosis and customised face and body treatments, this experience is a unique moment of excellence and escape. A skin treatment every time different, every time custom-made, only for you. 5 images, 2 sensors, 7 imperfections… a beauty check-up for your skin in just a matter of minutes. A customised beauty ritual to suit your needs. This diagnostic machine is the most sophisticated in the world, offering a skin analysis that’s both hyper-high-tech and fun. Technology at the service of beauty. A relaxing skincare to rehydrate and regenerate the skin. This treatment is a real journey of the senses that helps your skin return to its optimum level of moisturisation and suppleness. It offers very precise kneading and palpate-and-roll techniques. A true moment of relaxation that allows you to really let go. The treatment expert alternates between relaxing and invigorating sculpting to relax accumulated tension and uses selected treatments to revitalise the skin deep down. A relaxing treatment to re-moisturise and regenerate the skin. A signature personal treatment offering completely holistic care. Our Beauty Expert Team would be happy to help you.